Chickens have shown that they react and appreciate complex rhythmic acoustic patterns, according to preliminary research results by an International research team including the University of New England. Professor Gisela Kaplan from the School of Science and Technology as part of this team has studied newly hatched chicks and their preference in approaching an acoustic source emitting rhythmic patterns. It was hypothesized that untrained chicks will be capable of responding to rhythm. “To ensure that the newly hatched chicks had no experience to any regular rhythms, such as the heartbeat of a brooding hen, we used artificially incubated eggs, and a large sample of 2-3 day old hatchlings were then tested. 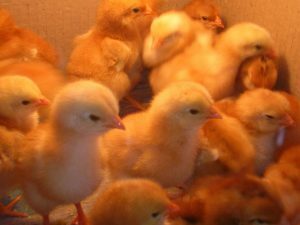 The chicks were placed in a running wheel connected to a computer so it was possible to accurately measure the revolutions of the wheel in the chicks’ movements towards or away from an auditory stimulus,” said Prof. Kaplan. The playbacks involved simple rhythms such as Foxtrott, Waltz and complicated ones such as bossa nova. The chicks were also treated to a legato, which is i.e. smooth continuous sound and other variations, interspersed with silences and, as controls, used the noise of the incubator. Professor Kaplan said the findings suggest chicks have the ability to discriminate between different rhythms is already well developed in chickens at hatching even without prior exposure to rhythm as embryos. Professor Kaplan says rhythm is considered one of the last strongholds of claims of human uniqueness, in the sense that the regularity that underlies strings of sounds is considered a core mechanism for the acquisition of language. The research has been carried out in collaboration with the University of Trento and the University of Trieste. The paper Chicks’ appreciation of complex rhythmic acoustic patterns is currently being presented at the CogEvo (Cognition and Evolution) conference in Rovereto/University of Trento in Northern Italy.